Built in 1942, the Little Church of the West is above all, the grandmother of all Las Vegas Chapels. 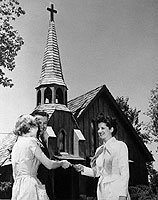 Most noteworthy, for 75 years wedding couples and celebrities have chosen the Little Church of the West for their wedding day. Especially relevant now being the oldest building on the Las Vegas Strip the Little Church of the West was placed on the National Registry of Historic Places. 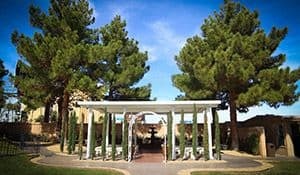 Situated within walking distance of the Fabulous Las Vegas Sign our Wedding Chapel in Las Vegas is the only free standing chapel in the heart of the famed Las Vegas Strip. In addition, the picturesque wedding chapel is located on one acre of manicured grounds. There is plenty of parking for your guests or we are a short trip from your Las Vegas Hotel. In conclusion, we would love to be considered as the venue for the magical day. Learn more about our historic chapel. Congratulation on your Las Vegas Wedding or Vow Renewal. Below is a link for friends and family to view ceremonies as they happen. After the ceremony has finished your photos and video are also available to view below. Only chapel made of California red wood. Since 1942 it has been one memorable day after another at the legendary Little Church of the West and what better backdrop for your eventful day than the luxurious glamor of Las Vegas, “The Entertainment Capital of the World”. The Little Church of the West has played a major role in the evolution of the city’s image and has been the scene of more celebrity marriages than any other wedding chapel in the world. Betty Grable, Judy Garland, Mickey Rooney, Dudley Moore, Cindy Crawford & Richard Gere, Johnny Hallyday, Angelina Jolie & Billy Bob Thornton, and even Elvis Presley (well, sort of…he and Ann Margaret recited their vows in the movie”Viva Las Vegas”, filmed here at the Little Church of the West) have all walked down our aisle to exchange vows. With wedding prices to suit any budget, you can be the next star at the Little Church of the West. The Little Church of the West, Las Vegas Wedding Chapel was conceived by William J. Moore Jr. in 1941 as part of his plans for a resort hotel, a relatively new venture in Las Vegas. Mr Moore was an architect and builder for his uncle R.E Griffith of California. Moore described his reason for inclusion of a wedding chapel as an attempt to garner a share of the lucrative and expanding wedding chapel market in the area. 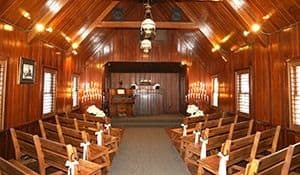 While the Little Church of the West was built to attract business to the Last Frontier, it was also the first such facility designed specifically as a wedding chapel. Others already in operation were converted from buildings which had a prior use. Originally built as part of the Last Frontier Hotel located on an isolated stretch of highway that would one day become the famous Las Vegas”Strip”, the Little Church of the West upholds the heritage of Las Vegas with its unique architecture. It’s a freestanding replica of an old west mining town church. With an exterior of cedar and an interior of California redwood, the chapel looks much the same today as when it was first built. It speaks of the early days of Las Vegas when its business district consisted of only the first three blocks of Fremont Street. As the town grew with the population boom caused by the construction of near by Hoover Dam, Fremont Street began to pulsate with wall-to-wall casinos. As first class resorts began to dot the desert skyline and big name entertainment lit up the beckoning marquis, the stage was set for the Little Church of the West to take its place in the annals of Las Vegas history. Attesting to its historical significance, the Little Church is listed on the National Registry of Historical Places, the only such place on the “Strip” with this honor. One of the requirements for inclusion is that the structure retains its original integrity. “It hasn’t changed,” says current owner. “I mean, there’s been some painting and re-carpeting but the pews in there are believed to be the ones built with the chapel in 1942.” The four Victorian lamps that light the chapel are believed to be from 19th-century railroad cars but have since been converted from gas to electric. 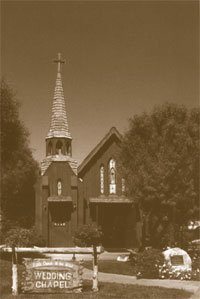 In 2017, the Little Church of the West will be celebrating its 75th anniversary and remains the oldest existing structure on the Las Vegas “Strip”. How did this quaint little wedding chapel stand the test of time and all the facelifts of the Las Vegas Strip? Simply put, it moved — 3 times to be exact. The chapel first moved from its original location on the north side of the Last Frontier Hotel to the south side in 1954. In 1978, it was moved onto the grounds of the Hacienda Hotel to accommodate the building of the Fashion Show Mall and in 1996, the chapel was moved to its current location on the corner of Russell Road and Las Vegas Blvd to accommodate the building of the Mandalay Bay Hotel & Casino. Smith says the chapel has been popular because of its historical significance and its unique appearance. “There’s a lot of mystique about the chapel”.